TNGOP press release, NASHVILLE, Tenn. — Former U.S. Senator, presidential candidate, and famed actor Fred Thompson passed away today. Thompson represented Tennessee in Washington from 1994 – 2003. He gained notoriety by barnstorming Tennessee with a strongly conservative message in a red pickup truck. Tennessee Republican Party Chairman Ryan Haynes remarked, "The news of Senator Thompson's passing gives me a heavy heart. This is a sad moment for all of us as our state has lost a larger-than-life figure. His quick wit, his hospitality, and his conservative beliefs reflected the best attributes of Tennessee. Senator Thompson was a statesman in every sense of the word. He will be missed as much for his friendship as he will for his leadership." ABC News - Former U.S. 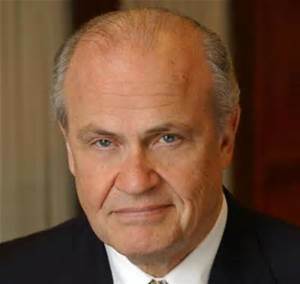 Senator and actor Fred Thompson has died at the age of 73, after a recurrence oFred Thompson, a former U.S. senator from Tennessee, GOP presidential candidate, Watergate attorney and actor who starred on the television drama "Law and Order," died on Sunday in Nashville. He was 73.f lymphoma, according to a statement from his family. Thompson, who served eight years as a U.S. Senator for Tennessee, was also a GOP presidential candidate, an attorney during President Nixon's Watergate scandal and an accomplished actor. The Tennessean - Fred Thompson, a former U.S. senator from Tennessee, GOP presidential candidate, Watergate attorney and actor who starred on the television drama "Law and Order," died on Sunday in Nashville. He was 73. .....In 1977, Mr. Thompson found himself representing the whistleblower in one of Tennessee's biggest political scandals. In her role as a parole administrator, Marie Ragghianti refused to release inmates granted pardons after paying then-Gov. Ray Blanton. Mr. Thompson successfully represented Ragghianti in a wrongful termination case, helping her win a settlement and a return to her job in 1978.